So.....Do you want the good news...or the bad news???????? SNORT! 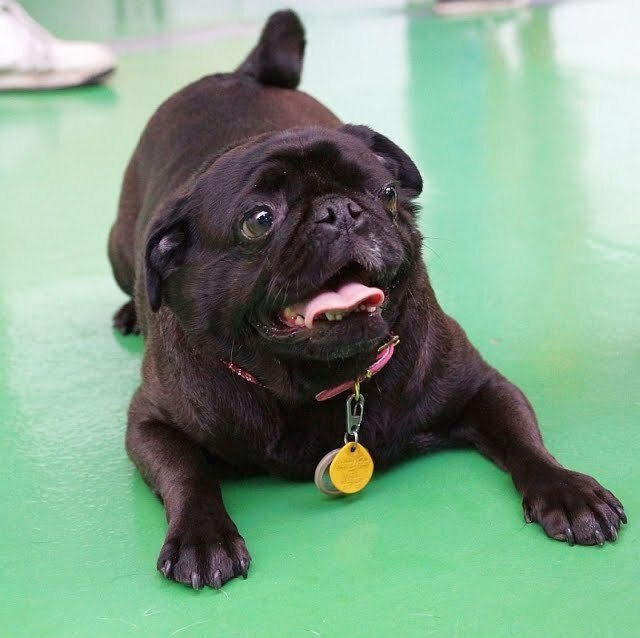 I guess, being a happy pug, good news should be first: I went to my follow-up orb doctor appointment...and...NO MORE LASHES, NO MORE INFECTIONS!!! Everything was a-o.k.! I wanna give a big snorty-thanks to everyone for the support and good juju vibes! Now the bad news, but it isn't that bad. My right orb has some pigmentation, so I have to use a white-toob-of-doom medicine once a day. The medicine will control the pigmentation that's covering some of my orb. It isn't so bad, as I get a real special treat when Mommy and Daddy gimmie my medicine. 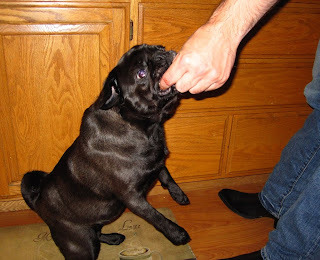 So, after a long day at the orb doctor, Daddy said he was craving something, after reading Puglet's blog. Hmmm....what could Daddy be craving....GOLDEN CHICKEN!!!! Daddy went to the big store that sells everything but pugs, and picked up the delicious piece-o-poultry...YUMMERS...Chicken is my all time favorite hooman food, i go pug-loony over it. GOT IT!!!! NOM NOM NOM!!! My belly is full, my orbs are good...Big adventures, here ! come!!! Yea!!! About your orbs. 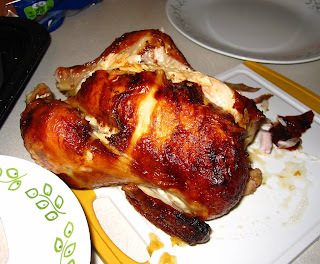 About chicken. You had me at the title...and then to find out your orbs are getting better? Party at Bellatrix's place!!! Bring more Golden Chicken! You rock Belly! We've been sending you good juju! Yeah Bella, this is lots of great news!! I have been on eye goop for pigmentation for about a year now. It has not only stopped the progression, but reversed some of what it had already done too! woot woot! That was me breathing a BIG sigh of RELIEF!!! Hey Belly its Trunks (Speedo...lol yes I read your comment on the DP) Glad you're feelin better! I am feelin a bit better too, going to vet today for a recheck. Can't wait to hear about your new adventures. That is great news. We've been really concentrating on the good juju for your orbs. The golden chicken almost makes it all worth it. We were wondering what the name of the eye goop that you and Pearl have been using. Both of us have pigmentation really bad and nothing seems to work. Yay! I'm so glad to hear about your orbs. My eyes are a mess and I wonder if that toob of doom would help them. I've never had golden chicken but it looks delicious! Maybe I can talk Daddy into getting me some. Bellatrix we are so happy to hear your orbs are finally betters! 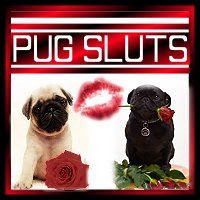 Don't worry us 3 puggers get the tube of doom everyday here too....Tuni gets it 3 times a day too OMP that is too many. Enjoy your Chickens! Hi everybody, thanks again for the snorty good vibes! The medicine is called Cyclosporine. It's supposed to help my orbs heal and decrease the pigmentation over my right orb. 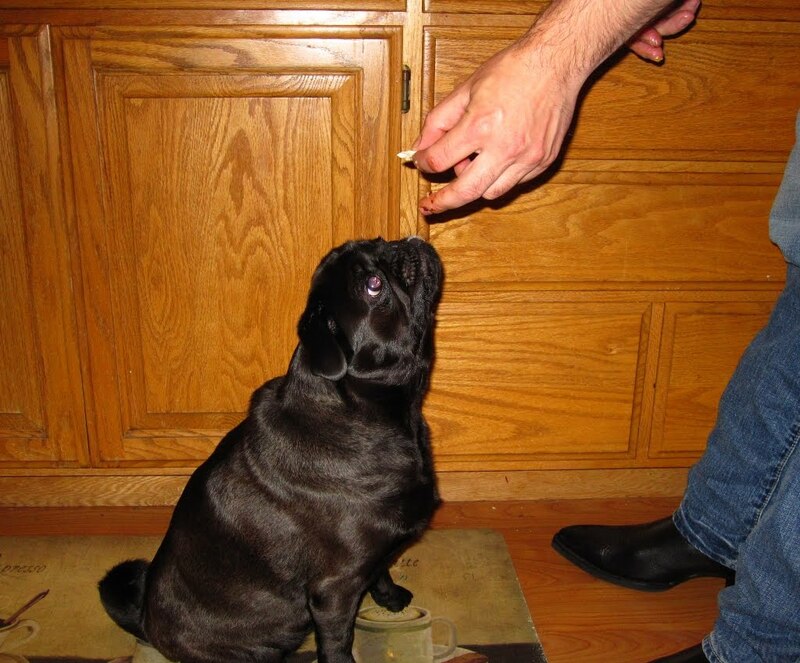 I don't mind it, as Mommy gives me super-delicious treats for being a good pug when the toob appears. I don't even run away anymore. Congratulations on your awesome great vet check! It's about time your super-orbs got back on track. Whoo hoo! So happy-excited for you! !